Keep up to date professionally, share expertise and gain emotional support by building effective networks. 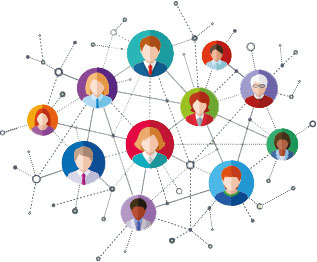 Making time for networking should be an essential part of every nurse’s career. As well as helping you get ahead professionally, it enables you to share expertise and best practice with colleagues and provide emotional support for one other. Nick Simpson, chief executive of health jobs recruiter MSI Group, says building effective relationships in the workplace is more important than ever. ‘Without a strong network, nurses will struggle to remain compliant at the most basic level,’ he says. Mr Simpson urges healthcare workers searching for their next job to actively engage with groups on professional networking site LinkedIn, and get involved with conversations on social media sites Twitter and Facebook. Think about what you can offer your colleagues, not just what you can gain. Remember details about people you meet. These can prove useful conversation openers next time around. Get online and join networks of like-minded individuals to increase access to opportunities. Be mindful of what you post on social networks. Realise the value of face-to-face networking. Limit your networking to nurses alone. Think that if you are in a short-term post, you don’t need to build rapport with your team – you do. Only network when you are looking for a job. But it is not all about using online resources. Never underestimate the value of face-to-face meetings, says Mr Simpson, and make an effort to learn and remember names and faces, as well as details that could provide useful opening lines next time you meet. If you find yourself with the opportunity to attend an event or conference, take it, and make sure you do your homework, advises Hays Healthcare director Simon Hudson. ‘Preparation is essential to getting the most out of any networking opportunity,’ he says. ‘Think about what your aims are, such as finding a mentor or a new job. Remain professional but approachable at the event, as you will be in the company of your peers, team members or potential managers. Health professionals from different disciplines need to work together towards common goals, so don’t limit your networking to nurses alone. ‘Build relationships with consultants, allied health professionals and porters alike,’ suggests Mr Simpson. ‘Not only will this give you access to perspectives that could help to improve the care you deliver, it could also prove valuable from a career development perspective. ‘Teams that forge close relationships work in synergy to deliver the best quality care and support each other,’ he adds. ‘But professionals who fail to network are reducing their chances of climbing the career ladder’.